The ten most populous cities where local leaders shield illegal immigrants from federal law could lose $2.27 billion in federal funds, a Reuters analysis has found. New York, Los Angeles, Chicago, and other large cities could lose federal funding for housing, education, airport improvements, HIV treatment, and more. “The [funding] numbers do not include federal money for law enforcement, which was excluded in the executive order, and programs like Medicaid, which are administered by state governments,” Reuters states. One estimate found 300 “sanctuary city” jurisdictions exist where state or local officials refuse to cooperate with federal law enforcement officers, and which order cops not to discover arrestees’ immigration status. Nationwide, at least 11 million illegal immigrants live in America’s towns and cities. 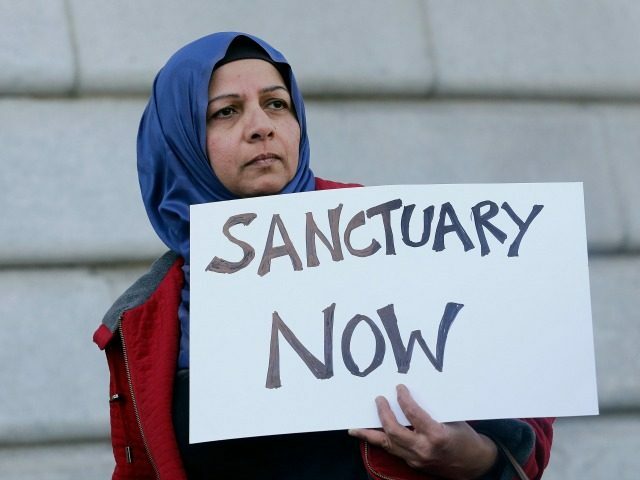 President Donald Trump issued an executive order Wednesday instructing Department of Homeland Security Secretary John Kelly to look at all channels of federal funding for sanctuary cities and determine how they can be changed by the administration. Trump’s actions could shrink local government workforces and indirectly bring some city operations to a grinding halt. The Port of Seattle depends on federal dollars to operate, for example. In response to the threat of lost funding, Democratic mayors like Rahm Emanuel in Chicago and Bill de Blasio in New York have made make declarations about taking the Trump administration to court. But the sanctuary city policies also create risks for local politicians. Under former mayor Rudy Giuliani, New York City forbid city employees from sharing information about immigrants and aliens to defend his sanctuary city policy after losing a Supreme Court battle. “Six days later, several visa-overstayers participated in the most devastating attack on the city and the country in history,” on 9/11, conservative commentator Heather MacDonald pointed out. The families of Kate Steinle and Sarah Root lost their daughters when illegal aliens in sanctuary jurisdictions killed them. Trump plans to increase the pressure on local politicians — he’s ordered deputies to collect and publicize data about crimes by illegal immigrants in sanctuary cities.